Designer Todd Oldham‘s new book, Kid Made Modern is a kaleidoscopic collection of kid’s crafts and a budding designer’s introduction to the masters of modernism. Kid Made Modern features 192 full-color, eye-popping pages of 52 craft projects that range from simple (Amazing Laces inspired by Jack Lenor Larsen: lacing high top sneakers with unprecedented flair) to more challenging undertakings (Kaleidoscope Movie inspired by Charles and Ray Eames: kids become psychedelic directors of their own animated film). The majority of the inexpensive crafts featured in the book may be brought to life using recycled or readily available household materials — and they are truly engaging, easy to follow, and accompanied by captivating, descriptive, step by step photographs. 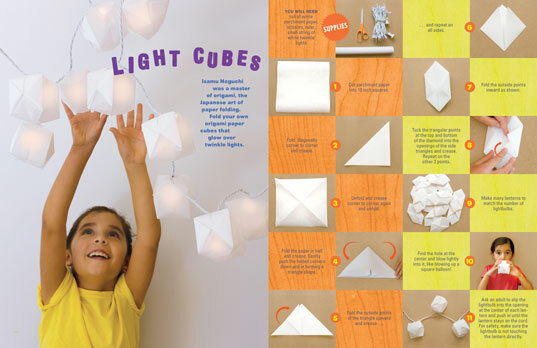 Unique craft projects such as ‘Light Cubes’ inspired by origami master Isamu Noguchi are interspersed with updated spins on old classics — the macaroni necklaces of yore are given a stylish update with a literal twist, becoming Aluminum Foil Leafed Rigatoni Necklaces. Kid Made Modern also features enlightening sections including: Color Mixing, All About Paint, All About Brushes, All About Printing, All About Paper… even All About Clean-Up, while also giving bite-sized bios on each mid-century designer who inspired the corresponding DIY project — making the crafty compilation a well-rounded introduction into art and design. A highly beneficial aspect of Kid Made Modern is that parents will love joining their kids in creating the projects within, spending many an occasion immersed in inventiveness. There’s an inspiring project for everyone, from tots to tweens. A masterpiece unto itself, Kid Made Modern is the quintessential book for green families interested in modernism and DIY crafts. Designer Todd Oldham's new book, Kid Made Modern is a kaleidoscopic collection of kid's crafts and a budding designer's introduction to the masters of modernism. Kid Made Modern features 192 full-color, eye-popping pages of 52 craft projects that range from simple (Amazing Laces inspired by Jack Lenor Larsen: lacing high top sneakers with unprecedented flair) to more challenging undertakings (Kaleidoscope Movie inspired by Charles and Ray Eames: kids become psychedelic directors of their own animated film). The majority of the inexpensive crafts featured in the book may be brought to life using recycled or readily available household materials -- and they are truly engaging, easy to follow, and accompanied by captivating, descriptive, step by step photographs.